The measure that would offer executive branch waivers to get around existing restrictions in law, in certain cases, was approved by the Senate Foreign Relations Committee in December, but has not yet been considered by the full chamber. The Obama administration has never labeled Morsy's removal from office a coup. But it froze some aid to Egypt last October following Morsy's ouster by the military and the subsequent crackdown on the Muslim Brotherhood. Aid totals $1.5 billion a year, $1.3 billion of which goes to the Egyptian military. The rest is economic assistance, some of which goes to the government and some goes to other groups. 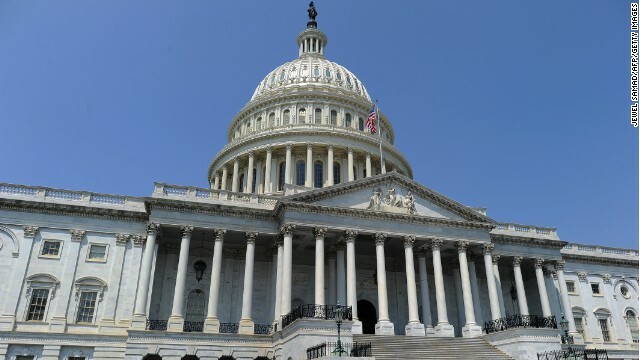 The administration officials and congressional staffers supporting the bill said it struck the right balance between pushing Cairo to embrace democratic reforms and maintaining the U.S. commitment to Egypt. Officials said the administration helped draft the language that was sponsored by Foreign Relations Chairman Robert Menendez, D-New Jersey, and ranking member Bob Corker, R-Tennessee. American aid to Egypt is viewed as necessary for national security - primarily the relationship with Israel and the growing influence of al-Qaeda linked extremists in the Sinai. While the bill is written with Egypt in mind, it could have wider implications for U.S. policy that bans aid to countries where a democratically elected head of state is removed in a coup or by the military. By providing the administration with waivers to sidestep restrictions on aid, it sets a precedent for U.S. aid to any country after a coup. Menendez has said suspending aid to Egypt did not serve the interests of Washington or Cairo given the scale and the strategic significance of the annual outlay to the longstanding Mideast ally. Moreover, there was concern the aid cutoff could cost U.S. taxpayers billions of dollars due to contract defaults of military equipment earmarked for Egypt. Under the proposal, the Egyptian government must meet certain security and economic assistance benchmarks, like adhering to the Israel-Egypt Peace Treaty, cooperating on counter terrorism, and taking steps to consolidate its democratic transition. This includes an upcoming constitutional referendum and subsequent presidential elections. In the future, it would require the Secretary of State to determine whether a coup took place and advise Congress of that decision. It allows the President to grant a waiver on aid restrictions for 180 days with another 180-day renewable period by arguing such a step is vital to U.S. national security interests and that the Egyptian government is committed to restoring democracy and the rule of law and fighting terrorism. Guys I cant believe we stop funding Egypt in this way.What a big mistake by our administration at the time. Should the US really be giving aid to yet another rogue and Islamic extremist nation? Yet folks this is the direction they are heading. Here go the right-wingers in Washington again, showing their stupidity. It's funny how they condemn "liberals" and yet they are the most liberal people of all when it comes to giving away our tax money!!! Let one of our rubber stamp "allies" come forward and give some of their money to the Egyptians for a change! "The administration officials and congressional staffers supporting the bill said it struck the right balance between pushing Cairo to embrace democratic reforms and maintaining the U.S. commitment to Egypt." Thanks God for Al Sissi. He accepted to become the biggest target by the terrorist hood and their affiliated wolrdwide terror franchises. Terrorism is in islamists as the chick is in the egg. If the hood, God forbid, returns to power try to imagine how moderate muslims and christians will be massacred ! Let us not forget how they beg God five times a day in their prayers to destroy America. This cannot be allowed to happen. Better to destroy for ever the hood scourge in all it's incarnations. The US senate shows the whole world the way to go. Egypt was a nice place before Muslim Brotherhood's reign of terror. Tourism was flourishing, Egyptians were making progress. Then, Muslim Brotherhood ruined it - there are no tourists. I hope the Egyptian military restores the decency which prevailed before the Muslim Brotherhood's took power and started to implement their Sharia Law. Is that why most Egyptians under Hosni Mubarak were languishing in unrelieved poverty while many young people were unable to find jobs and most people there were struggling just to survive, Nick? Would you like to have traded places with any of them? I think not!!! Excellent. The secular government in Egypt needs help from all around the world since they had to risk their own lives to throw the Muslim Brotherhood terrorists out of their government. The whole world needs to get behind the secular government and offer it full support to keep the Muslim Brotherhood terrorists out.